If you’re a hip-hop mogul, or you just happen to have children, Panasonic has just the item for you. The CN-HX900D is an in-dash head unit with GPS, CD/DVD player, Bluetooth, 40GB hard drive, iPod/iPhone compatibility and a 7-inch 720p high-def display. 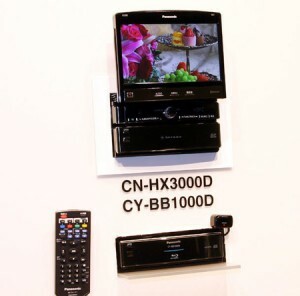 The CY-BB1000D is an optional accessory which adds Blu-ray Disc support. This unit will arrive in Japan by Fall 2009. There isn’t a date for the USA, but I’m sure we can expect something shortly after, even if it’s a different model. The most popular use for in-car displays is to keep kids preoccupied with Nemo instead of punching each other. Having Blu-ray in the car allows you to take the scratch resistant disc from your home to the car and back again. Makes sense to me.